Party chat improvements – Party chat is being improved with troubleshooting guidance for Xbox One owners. The Party App will help you get your microphone enabled and show you when privacy settings or networking issues are blocking communication with particular party members. 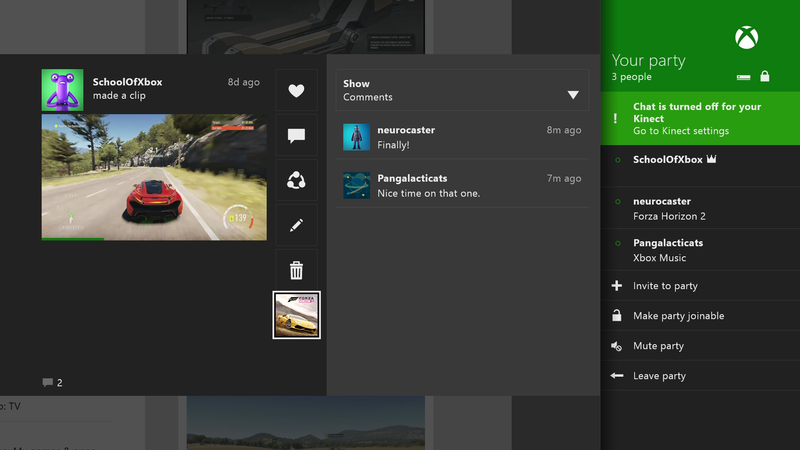 Game hub links – Members can more easily discover game hub content from activity feed items. You’ll see activity feed items when any of your friends follow a game, and you’ll also be able to get back to a game’s hub from activity feed posts related to the game – including feed items about the game’s achievements, game clips and screenshots. Finally, we’ve added a link to game hubs from the game’s page in the achievements app. Achievement notifications – With this preview release, you’ll also see the achievement’s description in the notification so you know what you did to earn this achievement without having to open the achievements app. If you do choose to open up the notification to see the achievement details, we’ve also made some performance improvements to make loading the achievements app from a notification faster. Stay tuned next week for the second wave with even more great features coming to Xbox One Preview program members. As always, thanks for your feedback.